6.1 What are Git and GitHub? Nephology is the study of clouds. Few modern technology concepts (other than maybe data science and artificial intelligence) have been hyped as loudly as “the cloud.” The cloud is simply a computer which we can access over the internet. In this chapter we’ll set up a cloud computer and we’ll learn the basics of interacting with one. To get the most out of this chapter you’re going to need your credit or debit card, or a PayPal account. We’re going to be using DigitalOcean, a company which we can rent cloud computers from. 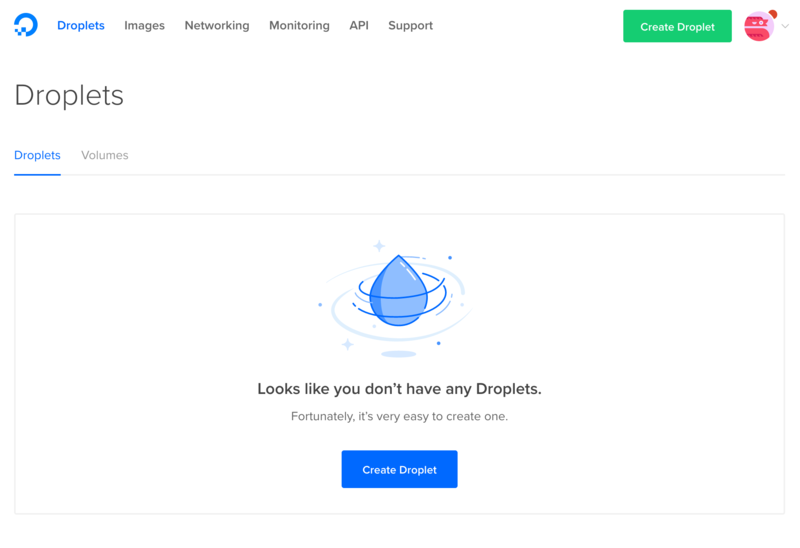 Throughout this chapter I might refer to cloud computers as servers (computers connected to the internet) or as droplets, which is a marketing term DigitalOcean uses to refer to their servers (a droplet is not a technical term). Renting from DigitalOcean won’t cost you any money since I’m giving you a coupon for two free months of service! 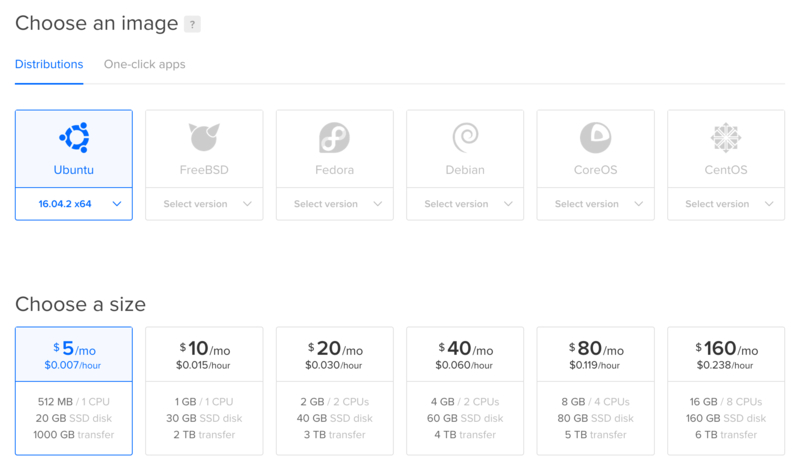 There are several companies that offer similar services compared to DigitalOcean, but in my opinion they have the best user interface and the most transparent pricing model. Warning: At the end of this chapter we will discuss how to shut down any servers we’ve started on DigitalOcean. If you don’t shut down your server after two months then your account will be charged real money for using DigitalOcean. Please be sure to shut down any servers you start after you are finished using them. 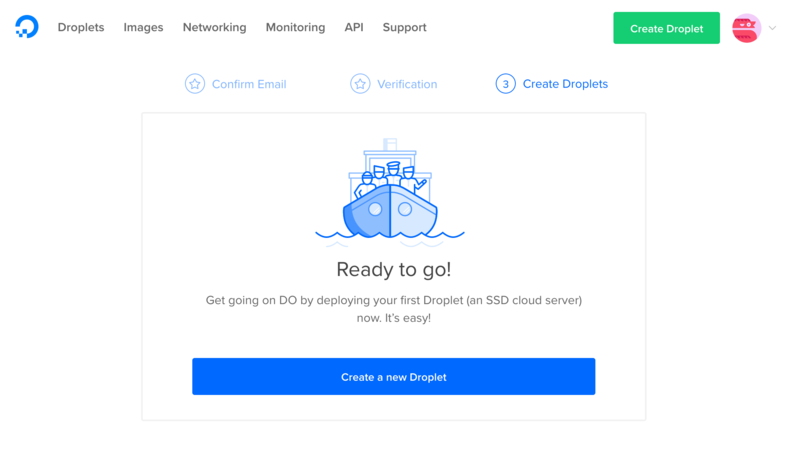 To get started with DigitalOcean we need to rent a server from their website. 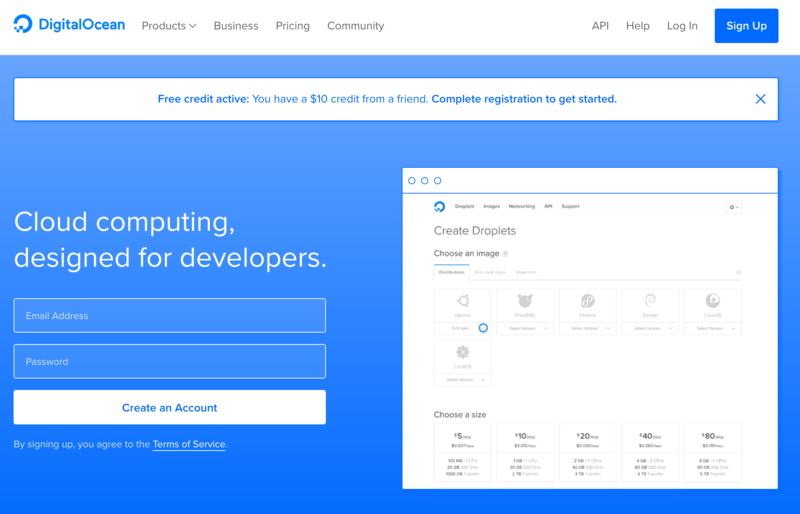 Click this link to sign up for DigitalOcean in order to get two free months of server use. (If you don’t use this link then you don’t get two free months). Click Sign Up in the upper right corner, then enter your email address and choose your password. Finally at the bottom of the page click the big green Create button in order to start your server! It will take a minute to launch the server, but once launched you should receive an email from Digital Ocean with the details about your new server. Included in this email you should find the IP address of your server, the default username (which should be root) and a randomly generated password that you will need to connect to your server for the first time. Once you’ve received this email open up a new terminal. ## The authenticity of host '159.203.134.88 (159.203.134.88)' can't be established. ## ECDSA key fingerprint is SHA256:UhtoIx/3c6/MmAIE+H8w5oGE06PsbXdzRRsAUhKtjhs. ## Are you sure you want to continue connecting (yes/no)? Type yes and then press Enter. ## Warning: Permanently added '159.203.134.88' (ECDSA) to the list of known hosts. This password should be in the email you received from DigitalOcean. Copy and paste the password into the terminal, then press Enter. ## 0 packages can be updated. ## 0 updates are security updates. ## individual files in /usr/share/doc/*/copyright. ## Changing password for root. We now need to create a new password for this server. First paste in the old password and press Enter. Then think of a new, strong password and enter it into the console. Then enter the new password again to confirm. After entering in the new password we should have a prompt! Press enter a few times to make sure that you get the prompt back each time. We’re in! In order to disconnect from the server and return to your machine use logout. ## Connection to 159.203.134.88 closed. Enter your password and you should get the prompt back for your cloud server. ssh connects you to computers that are connected to the internet. The template for the command to connect is ssh [username]@[IP address]. To disconnect from an ssh session use the logout command. Looks like it worked! Keeping files in the cloud allows you to work with the same files in the same workspace as long as you have access to a terminal and ssh. There are tons of servers out there on the internet! The way you’re probably used to talking to a server is through a web browser, but there are other ways we can talk to servers on the command line. One of the most popular command line programs for talking to other servers is curl. The curl command allows us to send requests and information to other servers. ## # What is Unix? Looks like we’re getting the response we expect. Before we go on I should clarify: curl sends HTTP requests. HTTP is a technology for sending information over a network, and HTTP powers much of how the internet works. There are different categories of HTTP requests, and the categories are often called verbs. When we use curl without any flags we are sending a GET request (GET is an HTTP verb). A GET request is a message that says to a server: “Hi, I live at [IP address]. Would you mind sending some information about yourself to that IP?” In the case above we asked for our own IP address, which httpbin.org knew to just send back to us. The text that we get back from the request specifies four information groups: args, headers, origin, and url. 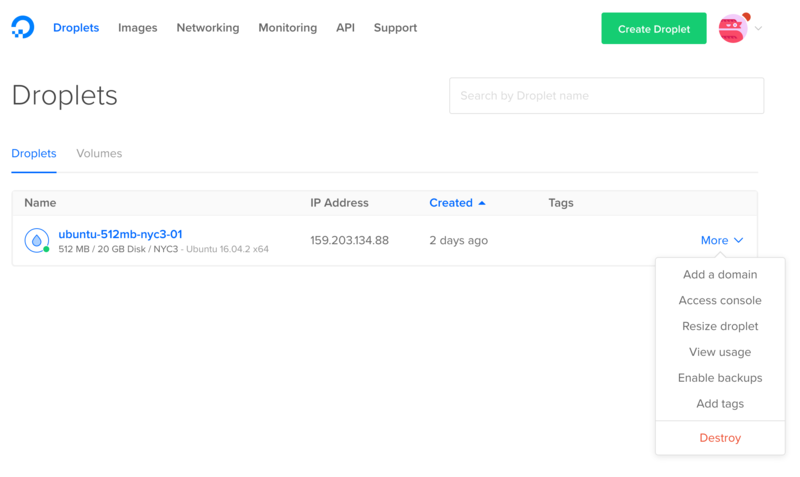 The origin shows our own IP address, and url shows where we sent the request. The headers group shows some interesting information, including the User-Agent which shows that httpbin.org knows that we sent this request with curl. Notice that the args group is empty. The args group is short for arguments, which hints at the fact that we can provide arguments in an HTTP request, just like arguments we would use for a function, or the arguments we used in the GitHub API. Perhaps you could imagine building a server that accepts HTTP requests, and sends back different information depending on what arguments are provided (for example, send back a weather report given a location). Building these kinds of servers is an advanced topic that is outside the scope of this book, but there are lots of resources out there if you’re interested in building your own HTTP API on a web server. One of the most compelling features about any web server is that it’s always powered on and always connected to the internet. This means that we can instruct our server to perform tasks automatically, without us needing to enter a command into a shell. One of the most commonly used programs for executing other programs with a regular frequency is called cron. Let’s take a look at how to use cron to schedule a program to be run. If you’re not already connected to the server use ssh to connect. ps -A | grep "cron"
## Select an editor. To change later, run 'select-editor'. Now that we’ve chosen a text editor we can edit the cron table using the command crontab -e (cron table edit) which will automatically open nano with the appropriate file. Unless we delete the line that we entered in the cron table, the output from date will be appended to date-file.txt every minute. The single line of bash date >> ~/date-file.txt is a much simpler program than we would probably use in a cron table, though it’s good for illustrating how a cron table works. If you want to do more complex tasks with cron it’s better for cron to execute a bash script that you’ve written in advance. That way you can just specify bash /path/to/script.sh in the last column of the table. Besides numbers and the star there are a few other characters that you can use in cron table columns including a hyphen (-) for specifying ranges and a comma (,) for specifying lists of items. For example 00-29 in the Minutes column would specify the first thirty minutes of an hour, while 1,5 in the Day of Week column would specify Monday and Friday. Let’s take a look at another example of a cron table that uses hyphens and ranges so you can get a sense of how each character works. A program that is being run by cron is only as powerful as your imagination can stretch! If you’re familiar with the social network Twitter then you might have come across some Twitter accounts which create posts automatically like Emoji Aquarium, Old Fruit Pictures, or Endless Screaming. Many of these “bot” accounts are powered by cron, which uses Twitter’s HTTP API to post tweets regularly. scp copies files between a cloud computer and your personal computer. Use the -r flag in order to copy directories. curl allows you to send HTTP requests to other servers. Use the -O flag to download files with curl. ps -A lists all of the programs running in the background of your computer. cron allows you to schedule when programs are run. Use crontab -e in order to edit the cron table. Write a bash script that takes a file path as an argument and copies that file to a designated folder on your server. Find a file online that changes periodically, then write a program to download that file every time it changes. Try creating your own Twitter or GitHub bot with the Twitter API or the GitHub API. Congratulations on your new cloud computing skills!